The ALTA Performance™ Lightened Crank Pulleys for the Gen 1 MINI Cooper S is engineered to increase horsepower and torque. This is achieved by reducing the rotating mass of the crank assembly. Made from 6061T6 aluminum, the ALTA crank pulley™ is more than 6.2 lbs lighter than the stock crank pulley. The standard diameter pulley is not under-driven and will not affect the life of your engine. The pulley is a redesigned, lighter rendering of the stock crank pulley. The reduction in weight is effectively the same power increase as removing 100 pounds of weight from your vehicle. The ALTA Performance™ crank pulley will not wear out engine bearings or the oil pump and will not add any additional vibration or noise. Aftermarket, under-driven pulleys are prone to charging problems from being excessively under-driven. 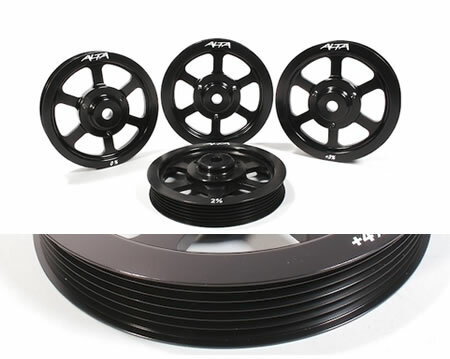 The ALTA Performance™ lightened crank pulley will have no effect on your car's charging system.